Luckily, the volunteers are high in spirit, and they are pulling all-nighters to pack loot bags for their candidates, to finish their last minute tips, and to prepare all the banners of support. 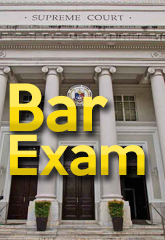 The Bar Exam is indeed the most hyped of all the licensure examinations in the Philippines, with thousands of students getting their act together to psychologically and morally support their candidates in the four most intense Sundays of their academic life. Here are the pictures they shared to us from the day before – November 4, 2017. Here’s how Far Eastern University sent their bar candidates off. Best of luck, Tamaraws! What better way to entertain your volunteers than with a free videoke session! The Chiefs from Arellano University are having fun! Here are their fancy loot bags! I’m sure they would help Arellano University break the Bar! New Era University sending their all out love to their bar candidates! With all the balloons and the cheers, the Bar candidates of San Beda College are surely ready! The Bar candidates of San Beda College are ready to slay, and perhaps to top, the Bar! Finally, here’s some love to all of you, guys!